Astounding Nepal: Everest & Beyond! 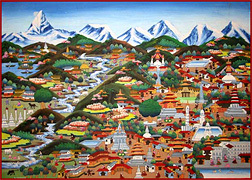 Nepal is where it all started! Trekking began in the '60s and quickly caught on with young adventurers. Early hikers loved the freedom to explore exotic and remote, roadless areas with just a small day pack. 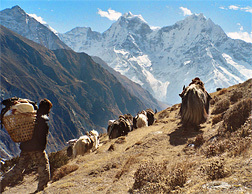 Local porters and Sherpas showed the way and were responsible for unimaginable mountain adventures. After a day's hike, you'd arrive in a remote mountain camp where friendly locals had set–up sleeping, cooking and dining tents and even a latrine! Trekkers explore or simply lounge once the rigorous trail time is over. This adventure still lives on today. 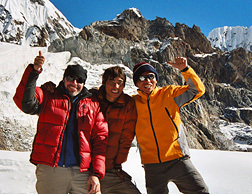 Trekking is popular for hikers who had little or no outdoor experience. Different from backpacking, trekking means you don't need to carry it all yourself from home. Led by an experienced local guide and with the help of able porters, almost anyone can enjoy the breathtaking Himalayas and discover the adventure of a lifetime! 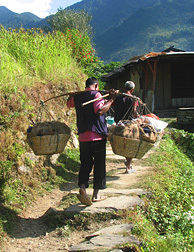 Teahouse trekking is another Nepal invention to enjoy. Traditionally in Nepal, a place on the floor to sleep was included in the cost of an evening's meal. Today's teahouses have evolved into very comfortable guesthouses where you're now up off the floor! Typical guesthouses offer private rooms with covered foam mattress beds, sometimes–intermittent electricity and shared bathrooms — including access to hot showers (yay!). The food is often simple but varied and you can order what you prefer from a menu. Considering the often–remote locations, these creature comforts are very appealing to a weary traveler. Nepal holds amazing diversity which boasts the tallest mountains in the world, including Mount Everest. The variety of the people who call Nepal home is fascinating, but it is also a very poor country — so historically, Nepal has suffered political unrest. It regained a democratic government and today is more peacefully moving towards stability. 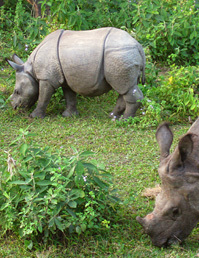 HHT trips have operated in Nepal without interruption since 1988. It's our expert local staff who insures that each visitor always feels safe and welcome throughout their journey. 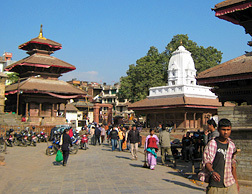 Most travelers to Nepal arrive by air into Kathmandu. Direct flights come daily from the major Asian hubs: New Delhi, Lhasa, Bangkok, Singapore and Hong Kong. Travelers from the Americas can need two to three days due to connecting flights, possible layovers and the result of crossing the international date line. Those visitors can count on one day less for the return travel home. Nepal truly holds an endless variety of trail options high above the clouds or deep within the dark tropical jungle. You can plan several light, three to five day family mountain treks, a month–long strenuous alpine trek — or anything in–between. Some of Nepal's most popular regions are Annapurna, Everest and Langtang but there are many other remote possibilities too — like Mustang, Makulu, and Dolpo. Wherever you want to trek in Nepal, our staff has first hand experience hiking there and can show you the way. Nepal trekking is especially–well supported, so a trek for only one person can easily be arranged and is reasonable (from $80USD/day). Our Custom Nepal Treks are always outfitted with a guide and porter to carry gear but with a larger group, a longer trip or by request, a cook and additional porters will join the team to aid a successful adventure. Nepal's trekking season is really year 'round. The best time for sharp, clear mountain views is mid–October to mid–December. The Spring months of March to April reveal warmer weather and wildflowers. Winter months can also be great for avoiding crowds on some popular trekking routes. The summer (in spite of the monsoon) can still be an option too — especially on unaffected higher routes. Nepal's food is excellent (even on the trail) with many good and healthy choices wherever you go. If you are a vegetarian or have important diet limitations, just tell us and it's easy to accommodate! Embracing many distinct cultural, ethnic and religious groups as well as Himalayan mountain highlands and ancient, lowland river jungles, Nepal has an appeal to everyone. From bustling Kathmandu to Everest Base Camp to lush Chitwan and beyond, we've supported children as young as two to seniors in their eighties on their own Nepal adventures. Travelers from around the world (including Australia, Canada, France, Germany, Israel, Namibia, The Netherlands, Mexico, New Zealand, South Africa, Spain, the United Kingdom and elsewhere) have relied on us to make their trip a success. You can too! 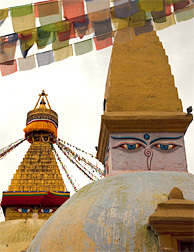 Buddhist pilgrims enjoy visiting Nepal's monasteries and religious sites, such as Lumbini where Buddha was born and Boudhanath one of the largest and most beautiful stupas (a temple–shaped place of worship containing Buddhist relics) in the world. Artists, students and travelers enjoy the country's museums as well as the rich cultural heritage of Patan and Bhaktapur — both declared UNESCO World Heritage sites. 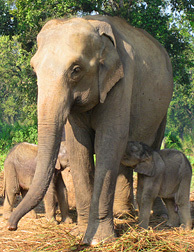 Roads in Nepal are not as extensive as in neighboring countries but many places can be explored by hiring a sturdy car or jeep with a slow, careful driver. You can also fly to major centers, such as Lukla, Pokhara or Chitwan and explore locally. You'll find many safari, raft, canoe and horse trips, mountain biking and other adventures to enjoy as long as the mighty Himalaya. Nepal's best craftworks reflect it's traditions, art and culture while applying specialized skills, local raw materials and the personality of the artist. Likewise, many imports are also to be found there too, so the visitor will see many options from the finest handmade artwork to imported commercial trinkets of every kind. You'll find nearly everything like inexpensive t-shirts and clothing, handmade games and toys, affordable handmade paper and jewelry and expensive, finely–crafted items too. 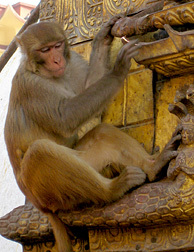 Tibetan rugs, religious items such as mala beads and statues, silver jewelry, Thanka Paintings, hats, bags, wooden items, masks, incense and decorative items are often most popular. Be observant for a local artist's workshop as you travel to discover something unique from your visit. That helps support local people, their crafts and helps keep their culture alive too. 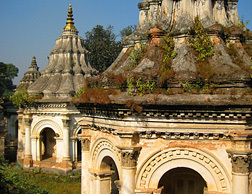 Learn More: Many films and documentaries have been made about Nepal. Some favorites include "Himalaya", "Little Buddha" and "Unmistaken Child" and are widely available on DVD. Custom Trips are unique by definition. It can seem to be an overwhelming prospect for you to design a Custom Nepal trip that becomes a rewarding, once—in—a—lifetime success... and that is where we come in. 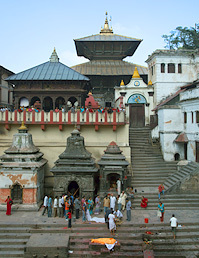 Nepal was one of our first trip destinations and it's an area we know very well from the inside. Our long experience (since 1988) gives us a local familiarity with Nepal, combined with our network of local staff that you just won't find elsewhere. 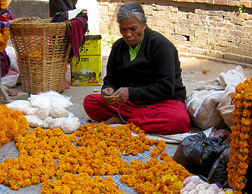 Dozens of travelers explore Nepal with us each year and you can too. There are many options to keep your trip unique, affordable, enriching and safe. Often a trip to Ladakh is part of a longer trip in India. We can help wherever you're bound. 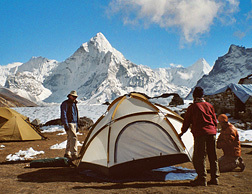 Once you have the ideas for your Nepal adventure, contact us to turn them into the adventure of your life. Give us your dream and we'll give you back an adventure that you'll never forget. Our Custom Trips page reviews how you can get started.